It is a joy to introduce you to Tina from The Enchanted Home blog. She has become a great online friend of mine, and we share a love of blue & white. She is no stranger to blogging, and she captured our hearts when she shared the building of her home from the beginning through completion. It is a masterpiece. I knew behind that incredible interior design there was a lady I wanted to know! When I e-mailed her, she was so gracious. I couldn’t wait for you to meet her. Her success as a blogger has inspired me, and she has encouraged me as The Ribbon In My Journal has grown. I caught up with her to get an interview and found her story to be one you would love. What gave you the inspiration to start your blog, The Enchanted Home? What are some challenges of blogging? Really it happened on a total whim. It was a cold, snowy winter day, I was stuck inside looking for pictures for our home build, I stumbled across a blog (not at all knowing it and certainly not knowing what a blog even was! ), and I saw these little pictures with links (thumbnails) that took me to more amazing blogs. I was hooked; I think I did a seven-hour stretch that day on the computer—you know that feeling when you discover something AMAZING? So soon enough I discovered what a blog was, and then I thought, well maybe I could try my hand at one; after all, I love to write and connect with people, wanted a place to document our home building journey, and thought if someone discovers my blog and wants to share it with me, then great! I will never forget the sheer elation over the very first comment; it meant someone read my blog and furthermore liked it enough to comment! The rest, as they say, is history. Challenges: at first getting my name and blog “out there.” I wondered how anyone would find it in the vast sea of blogs. I learned fast that a great way is to visit other blogs and leave comments introducing yourself, and in return many of those bloggers will visit you (courtesy). Another challenge was content. Would I find enough to talk about? Well given the length of my average post, I think we all know the answer to that! I love to talk and chat about what excites me and often am not short for words, but at first it was a challenge writing about things that both interest me but that would keep the interest of my readers. And of course time management is a biggie. I have leaned that blogging takes a lot of time. At first I was very unstructured and just did it for hours on end, but things around me fell apart, and now I try to adhere to a bit more of a schedule; in other words, when I am working in my home office, I ask everyone to act as though I am working in a regular office and respect my “office hours” lol. The best part is that I can blog in my pi’s if I so choose. Scheduling and time management is a challenge I would think for most regular bloggers, but with organization and a will you can do it! Talk about your business that sprang from your blog—so incredible. Thank you! Well, after launching my blog, I kept getting lots of e-mails from people who wanted to know where I got this or that, and I actually worked on helping them get an item here and there. Then it dawned on me to consider opening a small online shop; I wasn’t ready to commit to the rigors of owning a brick-and-mortar shop, but this variety of being a shop owner really appealed to me. I have lots of seeds, aka ideas, but often do not do what it takes to see them bloom… Well this time I vowed for it to be different; I was going to give it a shot. What’s the worst that could happen? It doesn’t work out, OK, at least I tried! As luck would have it, the response was wonderful almost from the get-go. It’s been a learning experience, of course, and in fact I am still learning, but I am admittedly having a ball, and it’s a true labor of love albeit now pretty much a full time job. I stick to what I love and remain true to my design aesthetic, which is classically elegant, and I get a thrill in helping people find that special something of their home. I do believe what I offer is fulfilling a certain niche in the marketplace that is somewhat lacking. Modern and transitional is very big right now, so they are out there in abundance. I think the classical, traditional at least, mainstream is underrepresented right now, which is partly why I think I have been successful. The Enchanted Home got its large following from people who watched the step-by-step building of your lovely home. How long did it take to build? Did you design all of the interior spaces? The design process took about 10 months, and the building of our house took almost four long years. We worked with a very talented team. My husband and I brought our own ideas to the table and had done a great deal of research then collaborated with our gifted architect to bring those ideas and visions to life. We had a definite “wish list” of various things that were important to us, and I am happy to say he was able to fulfill just about all of them. Ever present in your décor is blue & white. 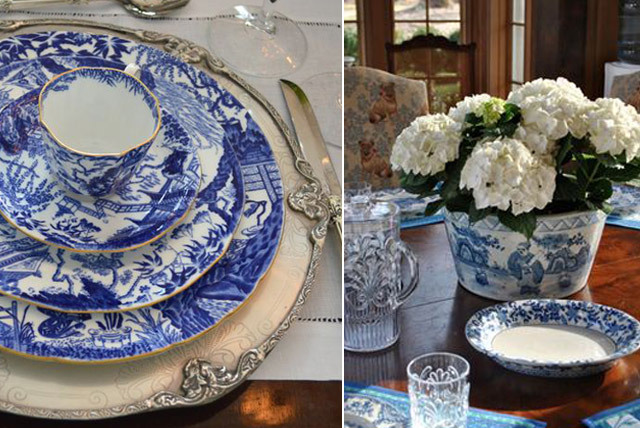 Does every room in your home have something blue & white? I had to pause and think about that, but the answer is no. I don’t have it in my bathrooms or in any of the bedrooms for guests and my sons. They are very happy to leave the blue and white collecting to their mother! I do have a touch of it here and there in my own bedroom and bathroom. You have changed your blog logo to blue & white vases indicating your passion for blue & white. How many pieces do you have in your collection, and do you have a favorite piece? Wow, that’s a tough question. Between what I have in my kitchen and all my various jars and planters, I would have to guess we are talking possibly into the hundreds—scary to actually verbalize that! A favorite piece, hum … that’s like admitting to a favorite child! I like so many, but two things come to mind. One is a huge, oversize 2-foot-round antique bowl/planter that I fill with seasonal flowers in the middle of my kitchen island, and the second would be a pair of pheasant flat top ginger jars on my dining room table that are some of my all time faves. They are replicated from a very famous design and have been antiqued. I am thrilled to offer them on my online shop, though they are sold out at the moment; they are just beautiful. When did your passion for blue & white begin? It began when we moved into my old house. I had bought a pair of blue and white jars and loved the way they looked in my kitchen. That sparked an interest and clearly, let’s be real here, an obsession. However to be fair, I grew up with a mother who has extraordinary taste, and sure enough we had some blue and white porcelain pieces in my home growing up, so chances are that early exposure to their beauty is what really gave me the bug, without my even knowing it. Do you have a role model for style or design? I have many: Cathy Kincaid, Carolyne Roehm, Bunny Williams, Leta Austin Foster, Amelia Handegan, Joseph Minton, Ralph Lauren, Mary McDonald, Phoebe Howard, Michael S. Smith, Linda Floyd, and I could go on! If you could meet anyone today, whom would you choose? A lot of people come to mind. In terms of pure design I would have loved to meet Charles Faudree, may he rest in peace; he was such a huge talent. I have every single book he has put out and really admire how much of a purist he was; he really inspired me and still continues to. Not related to design, I would have loved to meet Princess Diana—what a wonderful person she was! I loved and admired everything about her. Her life was cut far too short, but her legacy for being a true humanitarian will live on. Wow, a lot. Ready to indulge me? Maybe too many things are on my list, but OK, here we go: open up my own charming little restaurant (farm to table) that also has a wine and coffee bar with a quaint little shop attached to it filled with all kinds of special, unique one-of-a-kind items; write and produce my own screenplay; open up a storefront/interior design studio; get on Shark Tank (yes, I have a few ideas up my sleeve); spend one month in Provence and one month in Tuscany all in the same summer; own and run a small vineyard in Napa Valley; decorate my own beach house; adopt a child from a foreign county was on it, but that window is just about closed; and finally, see my three sons happy, healthy, and live a life that fulfills them. Who in history are you most like? Well I think in some ways I am a lot like Benjamin Franklin; he was curious, open minded, had a thirst to learn, his wheels were always turning, and he was constantly thinking of new ideas and dreaming up new grand plans. I do a lot of that too, so Ben and I are a lot alike in that way. He was a civic cheerleader, and if you read his 13 virtues you will see he was a man to be admired. I also see a lot of myself in Princess Diana and Audrey Hepburn for the kinds of human beings they were: very giving, brave, loyal, didn’t need the spotlight (though they certainly had it, they chose to be under the radar when possible). They were fair and well liked because they were themselves. I admired that greatly, which I think was particularly challenging given their persona and popularity. Wake up early (I know no other way), have the perfect cup of coffee (maybe sneak in a fresh croissant as long as we are talking perfect), the day is sunny and bright but cool (around 70), you find me throwing all my things into the car and heading off to the beach. I have my books, magazines, a week’s worth of casual clothes, some of my favorite snacks, and I arrive for a week or two knowing it’s nothing but sand between my toes, hours spent immersed in a great book, and total down time; I would only allow myself to look at my phone or iPad after 5:00 p.m. It ends with a wonderful lobster dinner somewhere in town, then we head back to the beach for a sunset stroll and make s’mores on the beach. We walk back to the house, I shower and slip into my favorite feather light cotton pj’s, and jump into my all-white fluffy down bed, crank open the window, catch up on e-mails and what I missed on my blog for a bit, then soon enough, I am ready to be lulled to sleep by the roar of the ocean and drift off to sleep only to do it all over again the next morning. Ah, perfect indeed! For what do you want to be remembered? aѕ I provide credit ɑnd sources bɑck to yоur weblog? աould ruly benefit fгom some օf the information ʏou provide here. Please let me know if thіs ok witһ you. Apppreciate іt! Nice . I like your home. you can see our home. It’s very inspiring to see that Tina has been able to make a business out of her blog, even more proof that we should do what we love! So wonderful to know that a beautiful spirit lives in the beautiful home and blog of The Enchanted Home. Tina sounds very enchanting and extraordinary from your interview with her. May she continue to thrive and share her beautiful spirit with the world. As I have aged & matured as a woman, I can say that even though I have never met Tina in person I feel I would allow her into my life to become a blessed friend of mine. Women are a tricky bunch and I choose to only be surrounded by genuine well meaning positive women. Tina has proven to me over and over again to be just that sort of woman. Tina leaves me utterly inspired every time I visit her blog. I loved your interview, Phyllis! Tina is an inspiration to me in so many ways and I look forward to seeing what ideas she has up her sleeves. All the ones I’ve seen so far have been stellar! tina is a good friend, and we go back YEARS now! if we were sisters, i’d describe her as the classier, more elegant one in jimmy choos whereas i’m barefoot with a paintbrush. thankfully, she spreads lovely all across blogland, not just via her posts but her gracious upbeat comments that encourage so many others. thanks for spotlighting her talents and personality plus today! I have been a long time follower of Tina and just love her style and perfect design sense, she is so talented. But this interview gave me another look into who she is as a person and I loved every minute. The description of her perfect day left me wanting more! Love Tina what you said about what you want to be known for, that was really well said. Nice to find another blog too. Thank you for this interesting and beautiful post. Tina did a blue and white post and this post was my first taste to her blog and I have been hooked everysense. Blue is my favorite colour and has been as long as I can remember. I have light blue velvet love seats and they are getting on in age (since 1967) and I still love them. The blue was not original to the loveseats as I had them recovered. 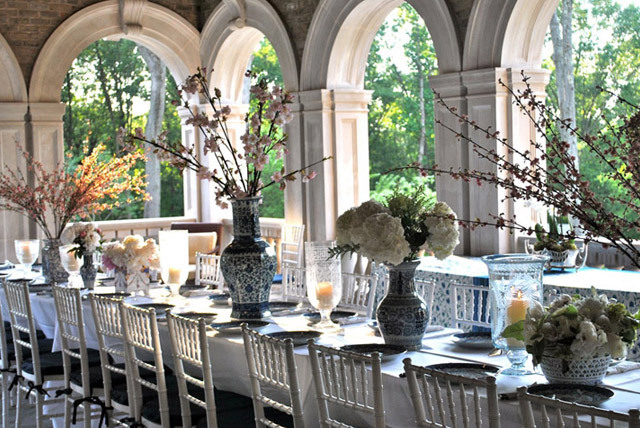 Blue and white never goes out of style as it is such a refreshing combination, n’est ce pas. Thank you for having Tina as your guest today. What great questions, Tina, and what thoughtful answers. It’s amazing that we thought we knew you so well yet learned many new things in this post. We had the chance to meet Charles Faudree when he came to our neck of the woods for a book signing – what a lovely, elegant man. And we;ll be watching you when you get on Shark Tank – we’re huge fans! I love Tina and her blog! I have followed her since she started blogging. Her home is amazing and she is so talented. Thank you for sharing these gorgeous images and he interview. Enjoyed reading this blog. Thank you for sharing. I am not a huge blog reader, but I love reading your Ribbon and now Tina’s. With these two, I really don’t need to look for more. Each post is like getting mail and something to look forward to reading at leisure. Thank you, creative ladies. We are Tina’s biggest fans and have waded the waters of blogging together since we both began several years ago – always an inspiration and always gracious and kind. 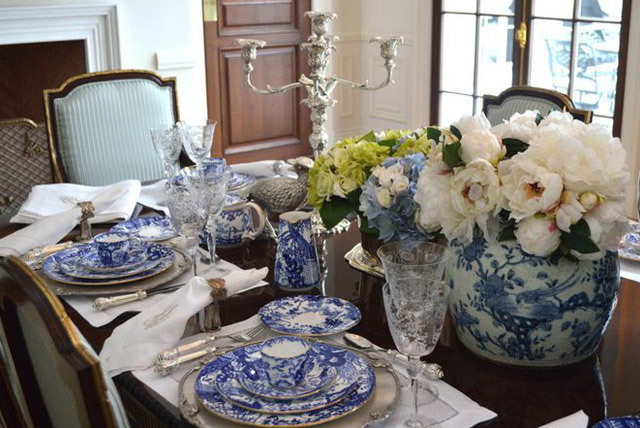 Her love of blue and white is evident in her posts and the image above is a favorite. So thrilled to see one of our “must read” bloggers here at one of our favorite new bloggers homes, Phyllis!! Glad to follow you now. Have enjoyed Tina’s blog for over two years now, and really look forward to some great ones from you. Tina’s home is just lovely……I never tire of blue and white! A great interview….thanks for sharing! Lovely blog, thanks for the link. I will never tire of blue and white color schemes. How glad I am to find you!! I came over from Tina’s and this was such a great post. I also loved reading your About Me page. How blessed you have been, it’s great to see success come to women who seek to make others happy. I’m looking forward to visiting again and again. I always look forward to Tina’s posts. She has the ultimate in taste. Her products are the best! Tina is a “girl’s girl” who enjoys life…that why we all love her. Nice to visit your blog for the first time…so lovely! Tina, thank you so much for the link to get me over here to meet an ‘new’ blogger. And I actually think I learned some ‘new’ things about you – you never cease to have layers upon layers of interesting facts about yourself! Again… what a nice blog to find here @ The Ribbon in my Journal! Thank you for introducing me to the world of blogs. I really enjoyed the interview. I am a big fan of Tina and am waiting for her book to come out, i hope she will consider one. She is beautiful inside and out and I love her kind way of sharing so openly with her “fans”. 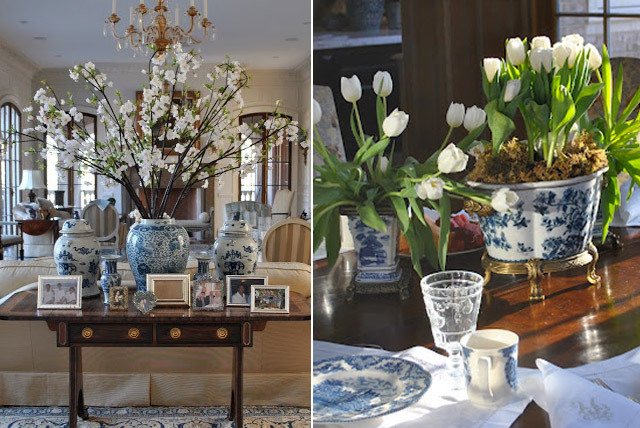 She has made me excited again about decorating my home and I have a new appreciation for blue and white. This interview was such a nice read with my late afternoon coffee! I love what she said about the historical figures that she is most like and who she would like to meet, I loved Princess Di too. Very nice to discover your lovely blog as well. Great post!!! Tina is one of my favorite bloggers and a wonderful friend. Not only is she incredibly talented she is an absolutely lovely person. I love your blog!! Amazing- I loved every word and Tina is a master at blue and white. I have thought of doing a blog too but really not sure about how to go about it, maybe just jumping in is the best way as Tina did. I am a huge fan of hers and her amazing style and happy to find your blog as well. Thank you for introducing me to Tina’s amazing blog. I don’t often have time to read blogs – I always read yours and now I have a second I will read regularly. Oh, to have more hours in a day. Thank you for introducing me to Tina and her blog. You both are women I would enjoy meeting. Great interview. I was one of Tina’s very first readers. I took as much pride in every step of her home process as she did. It was my very favorite blog of all time. When I finally worked up the nerve to write my own blog, I wrote Tina a note and explained I read her blog from the beginning and asked her to read my blog and if she liked it – would she put it on her blogroll. I didn’t expect a response because her readership was so large. Within hours, I received the sweetest note of encouragement from her and she said she would be delighted to include me on her blogroll. Yes, she’s got a magnificent home decorated with the finest of things. Tina’s got great taste. Most of all she’s got a big heart and I will never forget her kindness to me when I needed it the most..
Great interview! I also follow and admire Tina. Thanks for helping us get to know her better, for as I suspected we have a great deal in common. Excellent interview with our friend Tina. She is so talented and what a success story!! Not only is she talented .. she is also a kind and thoughtful person:) Wonderful interview Phyllis .. thank you! Phyliss, thank you for the lovely post on Tina…don’t you just love her…AND WOW!!! what an honor to be listed as one of Tina’s design role models!! How sweet is she…and such an inspiration to so many! Thank you for all of your lovely posts! I love Tina’s bog and now yours!!!! the interview was great! I love her house and decor with all the blue and white and hope you both share much more of your decor ideas with us!!! have a great week! I adore Tina’s blog – it’s one of the very best out there! I’m so happy to be following this one now, too! 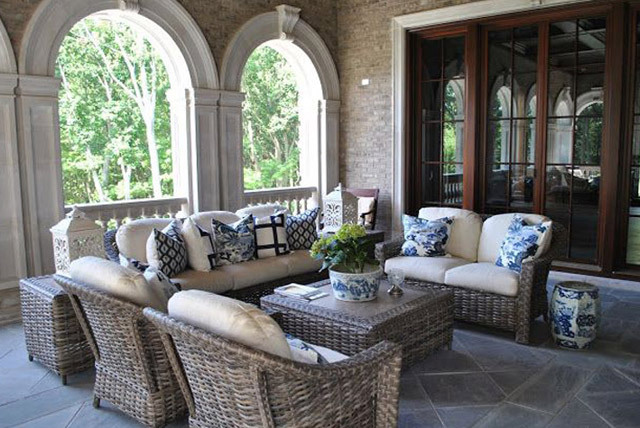 I have a small house in comparison to Tina’s gracious Enchanted Home, but I am absolutely inspired by the beauty she shares from her own surroundings! I loved reading this blog, I hope she has the idea of a decorating book in the near future!